Information Literacy: "recognize when information is needed and have the ability to locate, evaluate, and use effectively the needed information." "Online databases are organized collections of computerized information or data such as periodical articles, books, graphics, and multimedia that can be searched to retrieve information. Databases can be general or subject-oriented with bibliographic citations, abstracts, and/or full text. The sources indexed may be written by scholars, professionals, or generalists. Online databases that are retrieved from the World Wide Web are generally non-fee-based, lack in-depth indexing, and do not index proprietary resources. Subscription or commercial databases are more refined with various types of indexing features, searching capabilities, and help guides." "Research Tutorial." Using Research Databases. Prince George's Community College, 3 Dec. 2014. Web. 04 Dec. 2014. SIRS provides reliable and valid information on leading issues, access to historical and government documents, and current perspectives on the Arts andHumanities. It also provides pro/con articles and summaries as well as full-text articles. It is a great resource for research. SIRS is also invaluable to teachers. It has online books, full and blank maps, and other teacher resources. Grolier is an online encyclopedia resource for elementary, middle, and high schools. It also has information for adults, educators, and teachers. It has over 1200 interactive maps, 73 newspapers, and a dictionary. 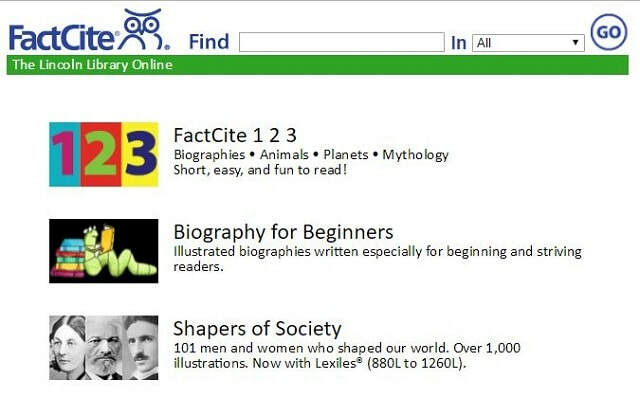 The database provides interactive games to promote learning. Educators can use articles and other materials that align with state standards, printables, and professional web links. Grolier is user-friendly and has something to offer everyone. Give students 24/7 access to Lincoln Library Press resources throughout your school or from home with FactCite: The Lincoln Library Online! Thousands of pages of content—including articles, illustrations, primary source documents, and online quizzes–with unlimited access from computers, tablets, and smartphones, anywhere with an Internet connection! Ask your librarian for username, passwords, and assistance.